Many online Canadian friendly casinos offer eCheck as a deposit mode for players to make a deposit at the casino to play real money slots. An eCheck or in other words an electronic check is similar to a paper check, the means by which you may take the information that usually is on (name, account number, amount, authorization) and enter it into software interface or any online payment form to transfer payments electronically. An eCheck is a safe, secure and fast online payment method. eChecks are specially designed as the safest digital transaction method in the digital internet world. eChecks use the state-of-the-art security technologies – SSL software, firewalls, cutting-edge detection systems, and encryption technology. Being easy to use an eCheck online casinos and poker sites offer it as one of their payment methods as well as withdrawal mode to get back your winnings. To deposit money with eCheck at a casino or poker room is simple. As a rule, money is instantly transferred from a player’s Bank Account into his/her online casino account. Depositing and sending money online are usually free of charge. To make a deposit with eCheck at online casinos First Initiate your deposit at the chosen casino from the casino bank or at the cashier page. Now choose eCheck as your deposit method. Next follow the on-screen prompts and complete your process. It isn’t necessary to give additional personal information to the site. There are a lot of online merchants accepting eChecks. eChecks can be used to load different payment methods, for instance, PayPal. To use eCheck with Paypal you only need to have a confirmed Canadian or US bank account to send an eCheck, but an Instant Transfer also requires a backup funding source such as a credit or debit card registered on your PayPal account. PayPal eCheck is funded from your bank account (the money is withdrawn from your bank account via PayPal) rather than your credit card or paypal balance and sent as a paypal payment. However, unlike other payment types on PayPal, the process takes several days to clear — PayPal will not release the amount to the receiver until the bank clears the echeck. How to send and receive a Paypal eCheck? First, you need to have your checking account linked to your PayPal account. If you already have your banking account linked to your PayPal account you can skip down to the Sending the eCheck heading. To link your bank account to your PayPal account you will need to provide your checking account information. You will need your routing number as well as your bank account number. Your routing number is the first 9 digits that you will see on the bottom of your check. Your bank account number is usually 8-10 digits long, and is located right after the routing number on the bottom of your check. You will only have to input this information once and then banking information will be saved. Begin by logging onto your PayPal account and click on the pay or send money Once you click the tab you will have the choice of either: sending money to friends or family, or pay for goods or services. Click the option that applies to you. Next, enter the recipients name or email address and click Enter the amount of money you will be sending and click next. Next you will see a tab that says ‘You’re sending with’. Below this tab you should see the name of your bank,followed by the words ‘checking account.” If you see this, it means you are sending the recipient funds using an eCheck. If you have more then one payment method linked to your PayPal account such as a credit card, you will see all your payment options on this screen. Be sure to select the option that says checking account. When sending an eCheck, you can check that status to see if it has cleared yet. To do so, all you have to do is click on the Activity Tab on the top of the screen. Next, click the box that says all activity and choose the payments sent option. If that status of the payment says uncleared then the eCheck has not yet been cleared from your bank account. If it says cleared, it means that eCheck has been deducted from your bank account and has been credited to the recipients bank account. Receiving an eCheck is very straightforward as you will receive an email notification like you would from any sort of PayPal payment. However the email will not say the money is here, it will say the money is on its way. This is because you have to wait for the eCheck to clear. It is important to know that PayPal eChecks can bounce like any other checks and it could take 3-5 days for it to clear. When the eCheck clears, you should get another PayPal notification that the money has cleared. Why eCheck is pending in your PayPal? If you are issuing a refund and don’t have sufficient funds available in your PayPal balance, an eCheck with the full refund amount will be issued. Note that an eCheck for the full amount will always be requested from your bank, since eChecks cannot be partially funded by a PayPal balance. As said above an eCheck is an electronic funds transfer from your bank account to another customer’s PayPal account. It is used to fund a payment that is sent from your PayPal account. Your payment will show as pending until the echeck clears that bank. It usually takes up to 3-6 business days for an eCheck to clear and the money to appear in the recipient’s PayPal account. If you are a buyer making a purchase or sending a payment to the casino, make sure you have enough money in your bank account to cover your eCheck payment. If there’s not enough money in your bank account, the bank will decline the payment and PayPal will request it a second time. Next time, you can pay instantly from your bank, by adding a credit or debit card to your PayPal account. Adding a card will allow you to pay from your bank instantly while using it as a backup payment method. When you send an eCheck, you’re able to see from which bank account your money is being transferred. Note that with PayPal you cannot send an eCheck if the Instant Transfer option is available. eChecks cannot be partially funded by a PayPal balance, so the full amount will always be requested from your bank. If you send an eCheck that is canceled by the seller, the total eCheck amount will be refunded to your PayPal balance in 3-6 business days once the funds clear from your bank. If you’d like to cancel an eCheck that has already cleared, you can contact the seller (the casino) directly to request a refund. The withdrawal is also simple, but it can take some time for money to appear on your bank account and there may be small fees attached to the withdrawing process. ← What are the fees for using PayPal at online casinos? November 15, 2018 Kamal Kaur Comments Off on How does Visa work with PayPal in Canada? 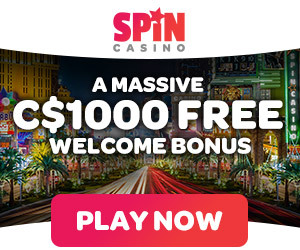 What are the best PayPal online casinos for Canadians to play slots in 2019? December 15, 2018 Kamal Kaur Comments Off on What are the best PayPal online casinos for Canadians to play slots in 2019?